Travel with me in your imagination, back to another time and place. … You might want to close your eyes. … It’s an unbelievable place. It has a sense of heavy quietness about it. You might know what I mean. I suppose, it’s like a cathedral. People are talking to each other in hushed tones. … Yet it still feels quiet. Countless people from every nation under the sun are here. Some splendidly dressed in their finery, some carrying the tools of their trade – blacksmiths, … jewellers, … carpenters. Others, clearly with little money, have made every effort to look their best. It is the 5th Century BC and as we scan the room we can see people of authority and power; Kings of Babylon, Media, Persia and Egypt stand erect and tall with their courtiers in attendance. Other kings and queens from unknown parts of the world are also here – Incas, Aztecs, Chinese, Indian and Ceylonese – everyone is here, with their monarchs standing proud in front of them. This is no ordinary cathedral, it’s too grand and large for that. The walls – too far away to see, the roof – higher and wider than anything we’ve ever seen. No columns hinder the view. The splendour of the room is beyond telling – it’s as though everything is covered in gold, and silver, and precious jewels. … Yet despite all this beauty everything in the room seems to point to its centre. On a raised platform is a magnificent throne. It’s like looking at the sun – seemingly all of the light in the room comes from that throne – … it is dazzlingly bright. It seems that wherever you are in the room the throne dominates your view. Suddenly everyone is aware of someone on the throne – the hushed conversation draws quiet. This is the moment we’re waiting for. … As our host stands up and moves forward the brightness which had seemed to come from the throne moves too. No one needs to say anything – everyone just knows who this is. The whole room is first on its knees, and then flat on its face before GOD. Our invitation to the heavenly court, says that GOD will be announcing his plans. Plans that mean declaring a chosen nation who will know God, and who’ll make his character known throughout the world. … All of the kings and queens are ready – jealously wondering which of them GOD will choose. …………………. One word from God and everyone is standing again; eagerly straining to see who it is. … Who has GOD chosen? ………….. From the back of the hall, somewhere behind the King of Babylon, a scruffy beggar stands and walks unsteadily forward to the throne. Some in the crowd look the other way as he passes, others try to stop him. It is only the voice of GOD which holds them still. 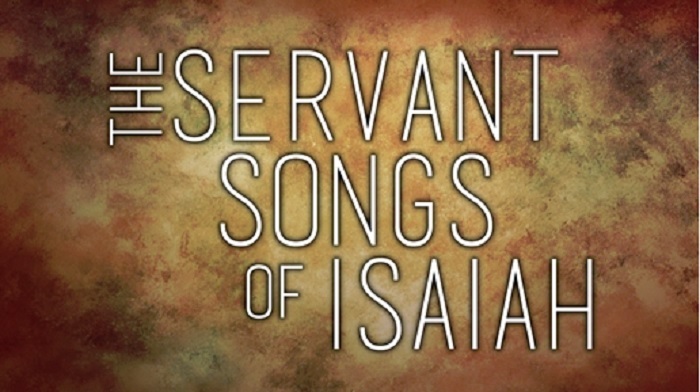 GOD welcomes the beggar and crowns him … ‘The Servant of the Lord‘. … It turns out that he is Israel, one of the small nations that have been conquered by Babylon. Insignificant, unimportant and of no consequence. What is God doing, choosing this non-entity, this tiny country, Israel? …. As you think about that question, take a moment to adjust back to being here, wherever you are now, reading this blog ……………. Comfort, comfort my people, says your God. Speak tenderly to Jerusalem, and proclaim to her that her hard service has been completed, that her sin has been paid for. My people, I took you from the ends of the earth, from its farthest corners I called you. I said, “You are my servant”; I have chosen you and have not rejected you. In Isaiah 42, God presents Israel to the nations as his servant. God confirms his love and protection of Israel and commissions Israel to serve him again. But even with Jesus this passage has not been fully fulfilled. 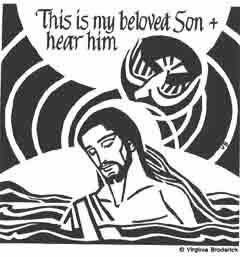 Jesus once said: “As the Father sent me so I send you.” Jesus passes on to us both the privileges and responsibilities of being the Servant of the Lord. We are called to bring justice, to be a light to the nations. Ultimately, it is us that God is speaking to in the Isaiah passage. He wants us to hear his encouragement as he picks us up, dusts us down and sets us on our way again. God knows that we so easily see ourselves as Israel saw itself – depressed and defeated – often struggling with self-pity, and full of shame and guilt. Or at times we see ourselves as right when others are wrong, we seek to build ourselves up at others expense, we cannot hear God’s love for us because we are so busy trying to establish our own reputation against that of others. And we are no different to Israel. Weak, mis-understood, seemingly at the end of ourselves, seemingly without answers to the problems of our day and if we are not very careful, seeing everyone else as the problems rather than ourselves. Whether it be our lack of numbers, the suffering and injustice of our world or the disregard of spiritual things by so many people, we have no overwhelmingly obvious, argument settling answers to the difficulties that life brings. Yet God speaks to us in the same way as he spoke to Israel. “You are my servants,” he says. God speaks to us in the same way that he spoke to Jesus …. God wants us to hear his words of comfort, to hold onto them as our own. To listen to his challenge to bring justice, to bring his assurance and to shed his light into the lives of those outside of the church community. God wants us to be those who show love and compassion, who because we are loved by God give space for others to flourish, God wants us to be those who because we are loved do not need to compete for affection and status, a people who build others up rather than tear them down. The truth is that it is our recognition of our own weakness that’ll mean that God can work through us to bring healing to our world. 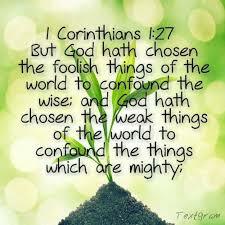 I Corinthians 1:27 – But God chose the foolish things of the world to shame the wise; God chose the weak things of the world to shame the strong. This entry was posted in Ashton-under-Lyne Blog, Comment on January 8, 2017 by rogerfarnworth.